From Goodreads: Finally, the complete Two Moons of Sera novel in one edition! Read all four volumes in one collection. In a world where water and earth teem with life, Serafay is an anomaly. The result of genetic experiments on her mother’s waterborne line Serafay will have to face the very people responsible to discover who she really is. But is she the only one? 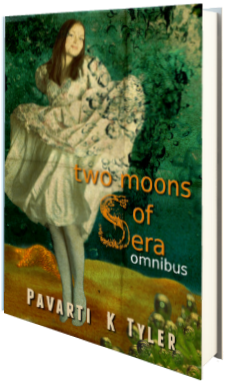 Two Moons of Sera—Omnibus, is the complete four part series all in one book. For me, it was like the element world met fantasy, complete with land dwellers–Erlanders, water dwellers–Sualwet, and even a fire dwellers–A’aihea. Segregated and at war with one another, Serafay knows little of any world. Half human and half Sualwet, and despised by both races, she’s lived her life in seclusion for her sixteen years. But today, everything she’s ever known is going to change. This four part volume takes place over the course of about a week, beginning with Sera as she hems and haws about her mother not allowing her to go anywhere aside from their beach, however, a sighting of a strange Erlander piques her interest and is the beginning of the end of life as she knows it. Meeting Tor is a godsend in a way, because soon after, the war between Erlanders and Sualwet takes a turn for the worst, and Sera is forced to flee. Hand in hand with Tor, the strange Erlander she met on the beach, her adventures begin as they find themselves in many a precarious situation. I loved learning about the different people of this world Tyler has created. The Erlanders are just like humans as we know them, living within the confines of cities, believing themselves superior, starting wars. But the difference here is the dystopian aspect—Erlanders are at the mercy of their government; they are matched with others, are given three chances to reproduce within their match, are assigned jobs, and are unable to make their own choices about basically everything. The Sulawet live underwater and are the equivalent to merfolk in my mind, but they also have the ability to walk on land. Their eyes and webbed feet give them away, and because land is foreign, most do not tread the ground often. They have their own distinct language, live in underwater cities, and disown/dislike any foreign object, people included. And the A’aihea are fire dwellers. The closest equivalent I was able to make in my mind was those who live near the equator. While the A’aihea people of Tyler’s story dwell in the mountains and deep underground, their lack of clothing due to heat, and their vast hatred of any and all foreigners, Erlander or Sulawet alike, made me think of a more tribal type of group. Overall, the vast similarity between these groups is their hatred for any and all foreigners. And it is this was Tyler speaks about in her writing, though it’s more of a theme than a direct admonition of the world today. I found the beginning of this novel to be a bit slow, but when Sera met Tor, the storyline began to pick up. As events unfolded, I found myself engrossed in the story, rooting for Sera and Tor and becoming quite protective of them as they found themselves on some fairly wild adventures with both Erlanders and A’aiheas alike. However, I must say that the very last volume left me wanting; there is minimal closure, and so I am sure that Tyler must be planning a sequel of sorts. While an epilogue does exist, it creates more questions than it answers, with the biggest of them all still left unanswered: what is Sera’s purpose the A’aihea spoke of? Overall, this is a great fantasy serial that I highly recommend, but know going in that this isn’t the whole story. Four stars.